NASA is studying a glitch with a backup computer on the International Space Station, an issue that could potentially force astronauts to perform a spacewalk repair and delay the planned Monday launch of a SpaceX cargo ship. Space station officials announced the glitch late Friday (April 11) after confirming that a backup computer on the space station's exterior was not responding to commands. The computer, known in NASA parlance as a Multiplexer-Demultiplexer, is a backup controller for some robotics systems on the space station. "The computer outage does not pose a risk to the six crew members aboard the space station," NASA officials wrote in a statement. 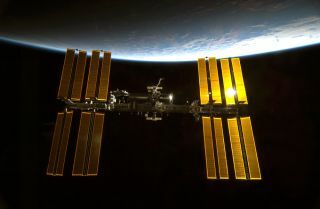 "ISS [International Space Station] teams are assessing next steps to attempt to bring the computer back online or replace it." The private spaceflight company SpaceX prepares its unmanned Dragon cargo ship to launch to the International Space Station on its third official supply delivery mission for NASA. Any plan to replace the backup computer would require a spacewalk by astronauts, NASA officials added. Meanwhile, the primary computer in the affected system is working normally. The glitch comes three days ahead of the planned launch of a Dragon cargo ship by the private spaceflight company SpaceX on Monday (April 14). The Dragon spacecraft is due to launch from Cape Canaveral Air Force Station in Florida atop a Falcon 9 rocket. It is packed with nearly 5,000 lbs. (2,268 kilograms) of supplies for the station's crew, but can only be captured by the space station's robotic arm. "The backup [computer] would provide redundancy for robotic systems that will be needed to attach the SpaceX Dragon spacecraft currently scheduled to launch on Monday and rendezvous with the ISS on Wednesday," NASA officials wrote in a statement. "NASA is continuing to work toward a Monday launch. SpaceX's Dragon launch has already been delayed nearly a month due to unrelated damage to a ground-based tracking radar system used by the Florida launch site that has since been repaired. Another company, the Dulles, Va.-based Orbital Sciences Corp., has a $1.9 billion contract with NASA for eight cargo missions using its own unmanned Antares rockets and Cygnus spacecraft. The first official Cygnus cargo mission launched in January, with the next one slated for June.